At the 25th Annual meeting of the International Association for Jazz Education in New York City (January 7-10, 1998), pianist/composer/educator and all-around jazz statesman Dr. Billy Taylor re-told a story of an encounter he had with Duke Ellington at the Hickory House in New York City where Taylor and his group were performing. One night after a set, Taylor sat with Ellington and asked him how he could improve his music, especially the playing of Ellington’s tunes. According to Taylor, Ellington replied: “Make the music your own.” At the aforementioned IAJE meeting, Taylor then proceeded to demonstrate his version of “Take the A Train.” He performed it in a slow, sultry tempo, using parallel 10th chords and a slightly modified melody line of this jazz standard which is usually played up-tempo. I have a similar story, but in my story I’m not having a conversation with Duke Ellington or Billy Taylor. My conversation is with music from the Hebraic songbook. In the early 1980s, I was invited to a Shabbaton, a weekend long celebration of the Jewish Sabbath. For this occasion I was asked to perform a standard Sabbath tune–L’Cha Dodi. At the time I was taking composition lessons with jazz pianist and composer Harold Danko whom I had met at a Billy Taylor led jazz songwriting workshop that ASCAP sponsored in 1980. While learning the piece I found myself organically exploring the jazz possibilities in the harmonization. Before long the piece became an opportunity for an improvisation in a jazz style. This was the beginning of my further exploration of Jewish liturgical and folk music as raw material for jazz arrangement and performance. While not intentional on my part, the Jewish liturgical and folk pieces I have arranged in various jazz styles is in keeping with this perspective. In a very real way, I have found a way to make these Jewish compositions my own. Just as the history of the Jewish peoples is about change and adaptation, so, too, is its music. And this has been an ongoing process for several millennia. As Abraham Zvi Idelsohn, the so-called “father of Jewish music research,” comments in his seminal work Jewish Music: Its Historical Development, “In surveying the development of music in ancient Israel it is essential to consider the music of Israel’s neighbors. In so doing, we are enabled to draw a conclusion as to the extent to which Israel’s music resembled that of the bordering countries of Palestine during the period of Israel’s development as a nation and thereafter, through the Second Temple until its destruction.” (p. 3). Idelsohn adds: “We observe that as the song of the other ancient Oriental peoples , so Israel’s music from earliest times was determined by its religious and social life, and the form of that music changed with the changes of Israel’s religious attitudes and political conditions.” (Ibid.) Seems that even in the beginning not only the Jewish people, but its music as well did not exist in a vacuum, but was most definitely influenced by extant conditions and contiguousness to neighboring cultures. It’s as if practice for living in the diaspora had early roots. Track 1. V’Taher Lebeinu means “Purify our hearts to serve you in truth.” It is probably a Chassidic tune composed in the first half of the 20 th century meant to be sung outside the traditional service. But it has become a melody that can be sung at every Sabbath, festival and High Holiday. It is usually sung during the Amidah (a prayer said standing), a part of the Elohienu. . . R’tzeh paragraph that goes: “God, take pleasure in our rest, Enable us to realize holiness.” In our version this tune is combined with another traditional melody-Yismechu Hashamayim. Yismechu also comes from Psalm 96 and is combined with a Chassidic melody. The traditional translation is “Let the heavens be glad and the earth rejoice. Let the sea and all within it roar.” In the version on this CD, Yismechu is played during a “piano only” interlude just before the up-tempo improvisation mid-section of V’Taher Lebeinu. Track 2. L’Cha Dodi: One translation of the opening text is “Beloved, come to meet the bride; Beloved, come to greet Shabbat. Shabbat peace and blessing.” Another translation is “Go forth my love to meet the bride. Shabbat’s reception has arrived!” Much has been written about this song. According to Stephen R. Schach in The Structure of the Siddur (1996), “L’Cha Dodi was written by 16 th century Kabbalist Shlomo Halevi Alkabetz; the initial letters of the first eights stanzas spell the name of the author. Text elements are taken from many books of the bible, especially Isaiah. The image of the Sabbath as “bride” reaches poetic heights in L’Chah Dodi.” Macy Nulman, in the Concise Encyclopedia of Jewish Music , writes: “[Alkabetz] based his theme of welcoming the Sabbath bride on the Talmud, which relates that Rabbi Hanina and Rabbi Yannai robed themselves and exclaimed on Fridays at sunset, respectively: ‘Come let us go forth to welcome the queen Sabbath’ and ‘ Come, O bride, come, O bride. '” But what about the melody? Alfred Sendrey, in The Music of the Jews in the Diaspora , observes: “For centuries this poem was the favorite hunting ground for Jewish composers, Eastern and Western, professionals and amateurs, serious tunesmiths and folk bards. There was probably no hazzan (a cantor) who did not try at least one musical setting to it. 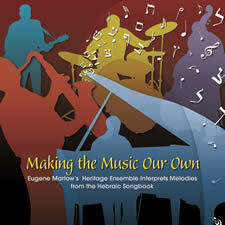 . . .there are about 2,000 musical settings to this poem.” In the version on this CD, there is only one. Track 3. Halleluyah: The term “halleluyah” means “praise the Lord.” It occurs 23 times in the Book of Psalms. It is regarded as the most exalted form in praise of God. The text is base on Psalm 150 and translates into “Praise Him, praise, with trumpet and drum, with strings and winds and voice. Praise him, praise, with song and with prayer, with joy, with dance, and with love. Let all who breathe sing praise to the Lord, Halleluiah, Halleluiah. Let all who breathe sing praise to the Lord, Halleluyah, Halleluyah.” The melody is a folk melody. In the version on this CD, the melody is played traditionally with an improvisation on the chord structures in the middle section. According to Dr. Joshua Jacobson, Founder and Artistic Director of the Boston Zamir Chorale, “During the Middle Ages, under the influence of the Kabbalah, Jewish bards began to compose zemirot, sacred songs for the Sabbath table. The lyrics were written down, but the tunes were not. So, while the poetry of these songs has survived, more or less intact, over the centuries, the music has changed as Jews in each land and in each generation have given new voice to the time-honored words.” This description is true in reverse for the piece I first heard as Tsur Mishelo, a Friday night Shabbath tune. The melody for this song originated as “Bilbililos,” a Ladino/Sephardic folk love song. I did not know this until very early 2005. Instinctively, though, when I began to play with this tune in the early 1980s, particularly the middle improvisation section, I felt it as a repeated base line in the left hand with modal improvisation in the right hand. Track 5. Hatikva: The Hatikvah text was written by the Galician poet Naphtali Herz Imber in Zloczow (Ukraine) in 1878 as a nine- stanza poem named Tikvatenu (“Our Hope”). In 1897 , at the First Zionist Congress , it was adopted as the anthem of Zionism ; later it was arranged by the composer Paul Ben-Haim , who based the composition partly on Ukranian Jewish folk tunes . Later the text was edited by the settlers of Rishon LeZion and it underwent a number of other changes until 1948 , when the state of Israel was created , and it was proclaimed as the national anthem of Israel. In its modern version, the anthem text only has the first stanza and chorus of the original poem. The most important addition in those parts is that the hope is no longer to return to Zion , but to be a free nation in it. It is an interesting, but not widely known fact, that the Tikva was never offically declared as or chosen to be the national anthem of Israel until November 2004 when it was sanctioned by the Knesset in an amendment to the “Flag and Coat-of-Arms Law” (which is now called: “The Flag, Coat-of-Arm and National Anthem Law”). The music for Hatikva is based on a folk song of unknown origin. The earliest known appearance in print was early 17th century Italy as “The Dance of Mantua.” It has also been recognized in Spanish religious music as the Catholic song “Virgen de la Cueva” (“Virgin of the Cave”) and the Jewish song “Prayer for the Dew.” It’s also recognizable as the Polish folk song Pod Krakowem. The folk song was also used by a English – Jewish cantor named Meier Leon, who used the stage name Michael Leoni to perform secular and Christian music such as Handel’s Messiah . Leon adapted the song into the Jewish hymn Yaigdal for his synagogue. This hymn was later adapted by Welselyan minister Thomas Oliver into the hymn To The God of Abraham Praise . The modern adaptation of the music for Hatikvah was probably composed by Samuel Cohen in 1888 . It’s possible he took the melody from Smetana’s work, or that he got the melody from a Romanian version of the folk song, “Carul cu boi” (“Carriage and Oxen”). Hatikvah is written in a minor key , one that may seem depressing or mournful to some people. However, as the title (“The Hope”) would indicate, the mood of the song is uplifting: As long as in the heart, within, A Jewish soul still yearns, And onward toward the East, An eye still watches toward Zion . Our hope has not yet been lost, The two thousand year old hope, To be a free nation in our own homeland, The land of Zion and Jerusalem. The first line of the chorus, “Our hope is not yet lost” has been compared to the opening of the Polish national anthem “Poland is not yet lost” (Jeszcze Polska nie zginela) or to the ukrainian national anthem “Ukraine has not perished, neither her glory, nor freedom,” similarities between Zionism and other nationalist movements have been pointed out. In our version, we play it in a 6/8-meter. Track 6. Havenu Shalom Aleichem is an Israeli folk tune. The title means “Peace Unto You.” It is also usually sung in a spirited tempo. One songbook describes it as a song for Oneg Shabbat. This piece can be played in a medium swing, cool jazz tempo, or as a bossa nova. At the end the arrangement is tinged with neo-classical touches. Track 7. Avinu Malkeinu: Avinu Malkeinu is part of the Yom Kippur service. The prayer translates into “Hear our voice, Lord our God, pity and be compassionate to us, and accept-with compassion and favour-our prayer.” We play it in 6/8 meter with a very definite middle-eastern flavor. Track 8. Ata Hu Hashem is from the liturgy. The text is: “You are the Lord our God. Grant peace, welfare, blessing, grace, loving kindness and mercy unto us and unto all Israel, your people.” The traditional music indicates a tempo of allegro moderato. Here we play it with a bossa nova feel. Track 9. Heine Ma Tov is a folk song. The text is from Psalm 133, verse I. The text means: “Behold how good and pleasant it is for brothers to dwell together in unity.” In its usual version it is a round, sung in a lively manner, perhaps with the clapping of hands. The traditional version is a 6/8 feel. In our version, the tune has become a 4/4 blues with a moderate swing feel.